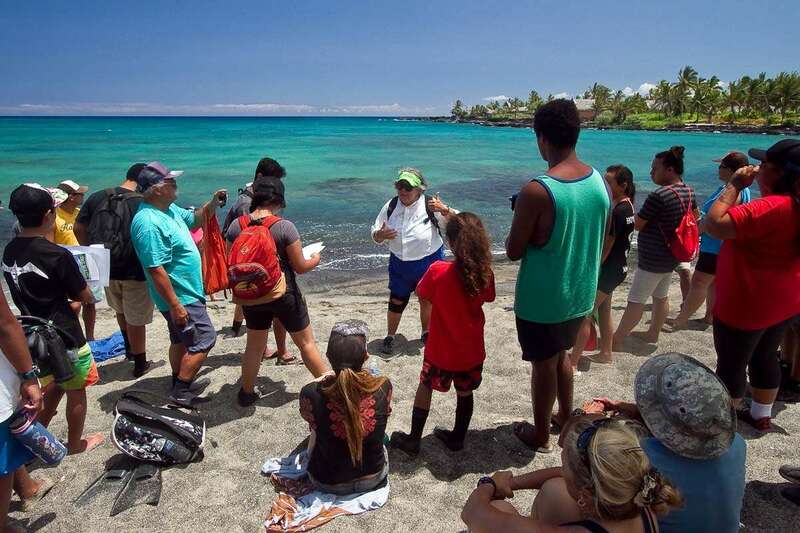 “The families of Kuki`o and Ka`upulehu, have resisted movement away from our `aina aloha, the region of North Kona, called Kekaha and further described as wai`ole (without water). A forever independent lot, we have been goat herders and ranchers, truck drivers and educators, always fishing our home waters and tending our gardens as the seasons of Kekaha wai`ole allow. We no longer live at the beach, but we always return to our ancestral shores: Kikaua, Uluweuweu, Kumukea, WaiaKane, Kahuwai, Mahewalu, and Kalaemano. Kekaha was isolated, it was not until June of 1975 that the Ka`ahumanu Highway was built across the lava plain, opening the previously remote shoreline, for the first time, to anyone with a car. With the opening of the highway, we immediately saw the decline of the tasty and charismatic shells, shell-fish, and fishes, which were easy pickings. And the decline continues. Others, who dive more compromised waters, might see “choke fish” at Kuki`o and Ka`upulehu, but we have been watching the persistent decline since 1975, and for sure, it is not as choked as it used to be. We recognize that multiple factors affect the quality of fisheries. We maintain intimate relationships with our home shores and try to be influential in their care, whether as on-site employees or skeptical neighbors. Through the land use planning and natural resources management processes, we are active citizens. We engage with one another. So we come forward with our proposal to “Try Wait”. 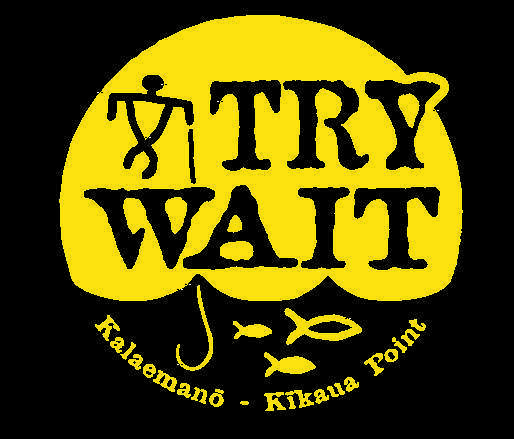 “Try Wait”, let the shoreline and waters of the area rest for 10 years. “Try Wait” is what we say NOT “try stop”. 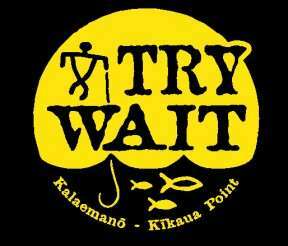 “Try Wait” with us, and when it is time to fish again, the `ono (flavors) we share will be sweet. 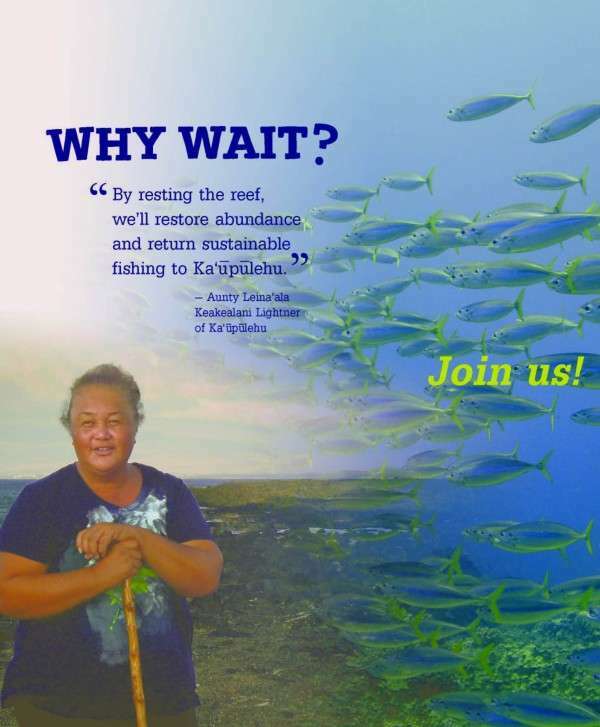 The public hearing on the Kaʻūpūlehu community’s proposed marine reserve has been scheduled at Kealakehe High School Cafeteria, 74-5000 Puohulihuli Street, Kailua-Kona, Hawaii, on Thursday, February 11, 2016. The informational meeting portion will be held from 6:00 to 7:00 p.m. The formal public rulemaking hearing will be held from 7:00 to 9:00 p.m. I was fortunate enough to fish and swim in these waters before the highway was built. I support the reserve as I have seen the decline in the resources Try Wait, sounds like a good idea. I support public access, but without reasonable controls on both access and fishing, our resources will be depleted.